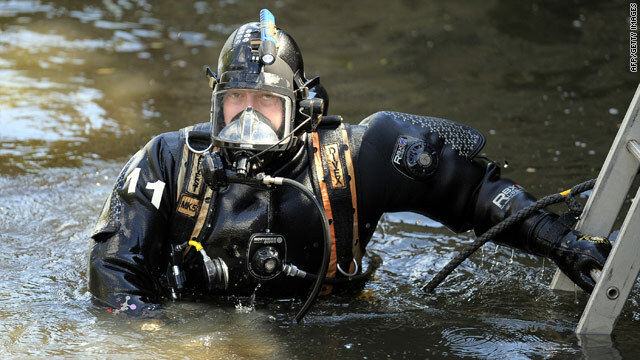 A police diver searches the river Aire on Friday for evidence in the killings of three prostitutes in northern England. London, England (CNN) -- A man charged with the murders of three women who worked as prostitutes in northern England called himself "the Crossbow Cannibal" when asked to give his name in court Friday, the court said. Stephen Griffiths, 40, appeared in Bradford Magistrates Court in Bradford, about 200 miles north of London. He was arrested Monday on suspicion of the murder of Suzanne Blamires, 36, who went missing on Friday, West Yorkshire police said. Griffiths is now charged with her murder and those of Shelley Armitage, 31, who went missing in April, and Susan Rushworth, 43, missing since June 2009, the court said. Authorities have not given the official cause of death for the women. The case kicked off this week after police found human remains in a river in Shipley, just north of Bradford. Police later confirmed the remains were those of Blamires. Griffiths is a student at the University of Bradford, where he was studying for a Ph.D. in local history, said Vice Chancellor Mark Cleary. Britain's Press Association said there were stunned looks throughout the courtroom after Griffiths called himself "the Crossbow Cannibal," and that someone in the public gallery gasped. There were about 40 people in the packed courtroom, including eight family members of the alleged victims, the Press Association said. Others included journalists and detectives. CNN's Bharati Naik and Claudia Rebaza contributed to this report.